Halloween evening, and due to an increased traffic presence around Manchester City Centre, we were prevented from arriving in time at the venue to see opening band Grand Magus. However, the actual date did manage to throw up a strange anniversary. It was exactly twenty-nine years to the day that I witnessed Testament support Anthrax in Belfast. Tonight’s special guests were again Chuck Billy’s Testament, a band I believe have never been given the full credit that they deserve. In my humble opinion they are right up there on the same level with the thrash music ‘Big 4’ legends. The band has consistently released quality albums of a high level which continues with their recent Brotherhood Of The Snake. 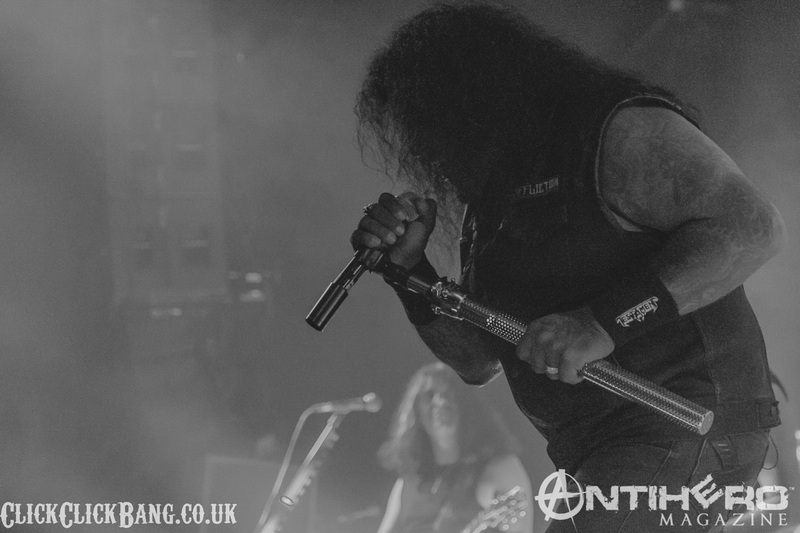 The changeover period between the opening band and Testament’s arrival was enhanced by the occasion, as a large number of the audience had actually came along in fancy and quite elaborate costumes, no doubt heading on to some Halloween parties and events once the metal had ended. On looking around the audience members it was no surprise that Testament had attracted quite a following. Their t-shirts were as common as that of Amon Amarth. I guess my view and opinion on them certainly wasn’t an isolated one. Opening with a couple of newer numbers, starting with the latest album’s title track, the band ripped into the auditory canals of the audience. Quickly following up with “Rise Up” from 2014’s Dark Roots Of Earth album, there was no time for catching a breath. It was great for a change to witness a venue packed out for a non-headlining act, and 95% of the crowd revelling and enjoying the thrash legends’ musical delivery. Presenting a balanced set between newer albums and old classics seemed to be well-received by the adoring masses. I have to admit to actually experiencing a nostalgic and retro moment with the quick-fire “Into the Pit” and “Over The Wall.” As I outlined earlier, hearing those two songs from a bygone era literally twenty-nine years to the day since I first saw the band perform “Into the Pit” was like stepping into my own time machine. Sadly, however, these days I no longer possess the hair to flail widely while air-guitar soloing. Still, I enjoyed those huge monster tracks that have retained their appeal after all this time. Closing the set (which seemed to fly by in an instant) with the title track of 2008’s much overlooked album, The Formation of Damnation, was quite a surprise. Testament had cemented my view of their quality and, despite being 29 years since I first saw them live, their music retains a timeless quality. The crowd has got themselves well and truly worked up after the awesome Testament, but now it’s time for the immense Amon Amarth. The stage is decked out with a giant helmet as a drum riser, shades of red, blue and purple thrown everywhere, and the audience is ready to go mental. And they do! Amon Amarth jump straight into “The Pursuit of Vikings,” followed by “As Loke Falls” and “First Kill,” the latter being from their newest album Jomsviking and sounding absolutely ferocious. Amon Amarth do a great job of whipping up the crowd, and it’s not long before the crowd surfers are flying over the barrier with great abandon. 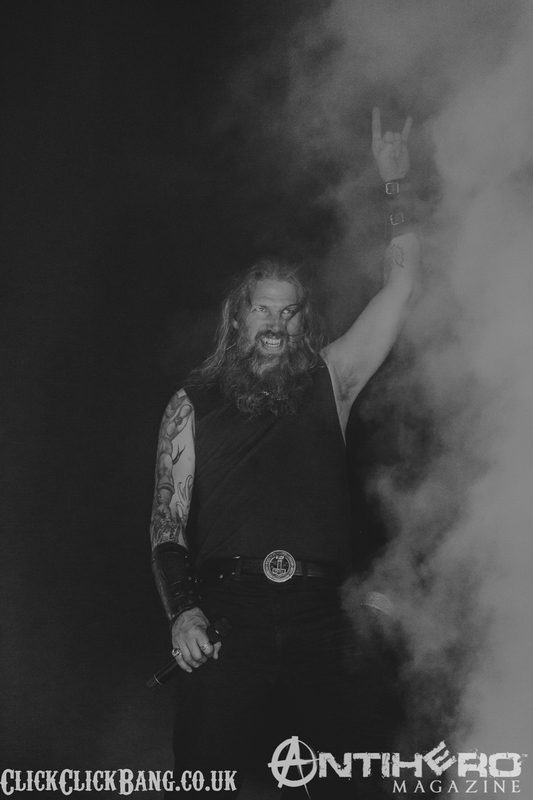 After the customary few minutes off stage, Amon Amarth return to the sound of 2000 people chanting ‘Raise your horns! !’ – so, of course they launch straight into it. Considering it is a track from the new album, this song is quite clearly one that the fans have fallen for and I think it’s going to be a frequent player at their gigs in the future. Swiftly followed by “Guardians of Asgaard” and the finale “Twilight of the Thunder God” (which sees lead singer Johan Hegg brandishing his giant Mjolnir-like hammer) Amon Amarth leave the stage triumphant, safe in the knowledge that they just blew the minds and eardrums of several thousand very happy metalheads.